As a mom with young kids, I love to help out in the school holiday parties whenever I can. Some parties it works out with schedules and the classroom needs and other times it doesn't. When I CAN make it to a holiday party, I love to put on my "therapy hat" and make the games movement-based, promoting development, and fun, all with a holiday theme. 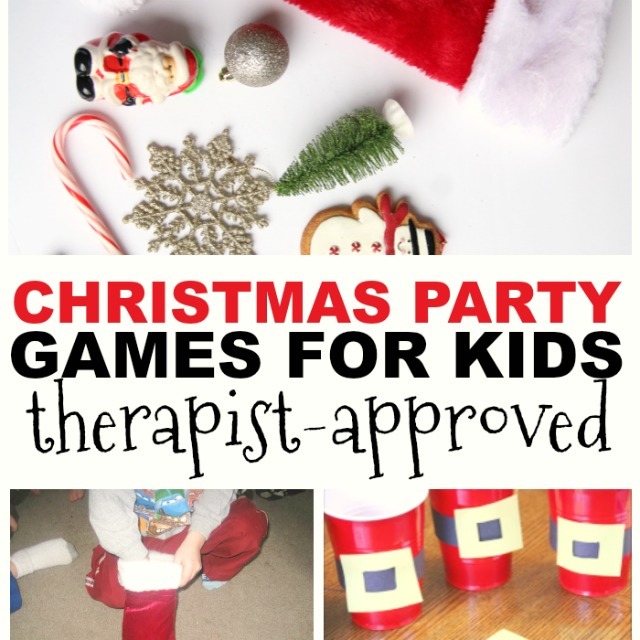 That's why I was super excited to share a collection of Christmas party games for kids. These holiday party games are perfect for promoting development, play, and movement with a Christmas theme. Use these kids' Christmas games for classroom parties, kid-friendly family parties, or even as a break from holiday shopping or while waiting at a restaurant. Each of these games are great for promoting the skills kids need while providing sensory input, visual motor skills, coordination, balance, and more. 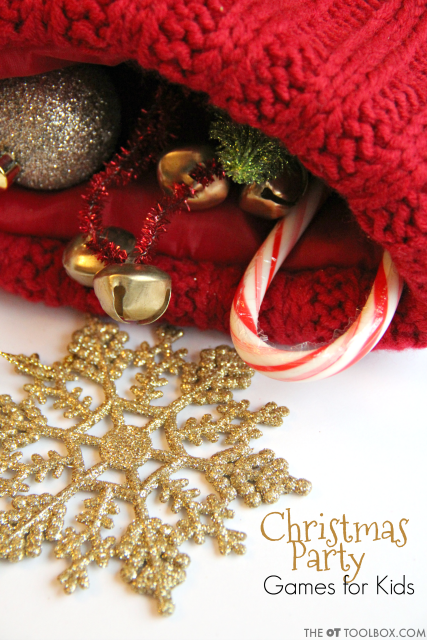 This post is part of this week's Christmas Activities for Kids series here on The OT Toolbox. Each day this week, we're rounding up fun and creative ways to play and support development in kids with a Christmas theme. If you missed any of the posts this week, be sure to check them out on the main Christmas Activities For Kids page. Are the kids ready for some holiday celebrations? Here are party games that pack a therapist-approved punch! First, this list of Christmas Proprioception Activities may be just the thing for a transition activity in the classroom. This time of year especially, the regular routines can be off and holiday excitement is on a high level. A movement activity can be a great transition activity. Christmas Twister- You'll need a Twister game for this party game. You could also create a Twister board on the floor using masking tape. On the Twister game mat, tape squares of paper. On each piece of paper, write Christmas-themed words. Each color should have the same Christmas themed word. Then, they can put their right hand on "gift" or left leg on "reindeer", etc. Santa Says- Put a spin on Simon Says with a Santa hat and even a beard! 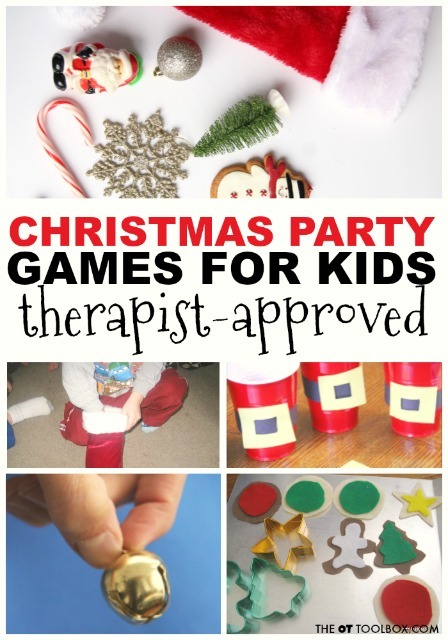 Kids can move, listen, and balance with this fun Christmas party game! Santa Toss- Use our Santa Snack Cups to play a game of toss. Kids can either toss cotton balls or ping pong balls into the cups or play a game of catch as they try to toss a ping pong ball from one cup to a partner's cup. Gift Push- Load cardboard boxes with heavy objects like books. Ask the child to push the boxes across a room. For less resistance, do this activity on a carpeted floor. For more heavy work, do this activity outside on the driveway or sidewalk. This can be a relay race where teams of students transport gifts across a room. The students can wear Santa hats as they push "sleighs" across a space. Reindeer Kick- Promote calming proprioceptive input through the upper body with wheelbarrow race type movements. Kids can also stand on their arms and legs in a quadruped position and kick their legs up. Try other animal walk types of movements with races with a group of students or children. Mitten Toss- Fill a plastic sandwich bag with dry beans and tape to secure. Push the filled bag into a mitten. Use the mitten as a DIY bean bag in tossing target games. Or, make regular bean bags into snowflake beanbags. They can be used to toss into a bucket or bin. Bean Bag Relay Race- This is a great relay game for a large group of students. Split the group into teams. Each team should stand in a line. The beanbags can be in a bucket in front of the first person in each line. The first student can pass the bean bag between their legs to the person behind them. That person can pass the bean bag to the student behind them by handing it over their head. Each team can race to pass all of the bean bags over and under the heads and legs of each member in the lines. The first team to get all of their beanbags to the end of the line wins. Snowball Toss- Use a ping pong ball or soft craft pom pom in a tossing game. Use these homemade Santa Cups as targets. Making the cups is half of the fun! Christmas Cookie Relay- Make these EASY no-sew felt cookies and use them in a relay race with friends. Teams can race to move all of the cookies on a cookie tray to plates on the other side of the room by using a spatula to carry ONE cookie at a time from the cookie sheet to the plates. The first team to finish is the winner! Jingle Bell Shake- Every child puts their head down or covers their eyes. One child moves around the room and shakes jingle bells. Other students need to listen to where the child moves. Then, the child stops shaking the jingle bells and continues to move silently. They can hide somewhere in the room. Then the other students need to race to where they think the child is hiding. 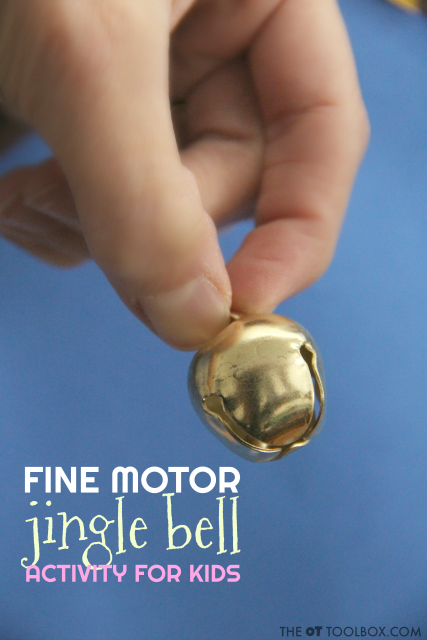 Ask students to hold jingle bells by the small loop to promote fine motor skills, too! Christmas Gift Wrap- Wrap a gift with many layers of wrapping paper. Two kids can put on oven mitts and race to open a gift. The first one to open the gift wins. To play with a group of students, use a timer and have the kids attempt to open the gifts for 10 seconds, and then pass the oven mitts to the next player when the buzzer sounds. Stocking Guess- Fill a stocking with many small items. A child should reach into the stocking and feel an object. They can guess what the object is by touch. Try to guess all of the objects in the stocking. 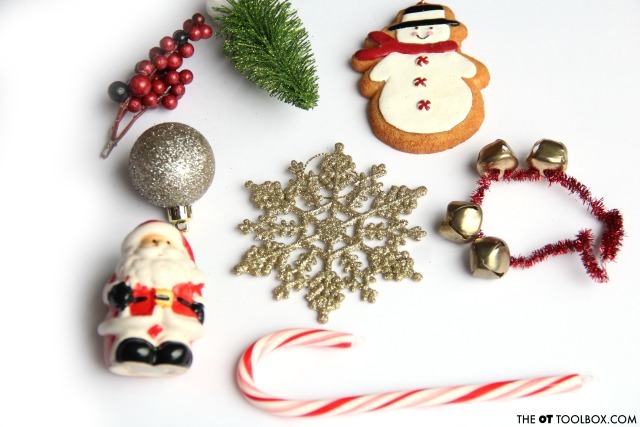 Use items like small ornaments, mini candy canes, miniature Christmas trees and other items. DIY "I Spy" Christmas Game- We played this DIY I Spy game with real toys in the past. For this Christmas party game, you will first need to gather various small items and Christmas themed toys. 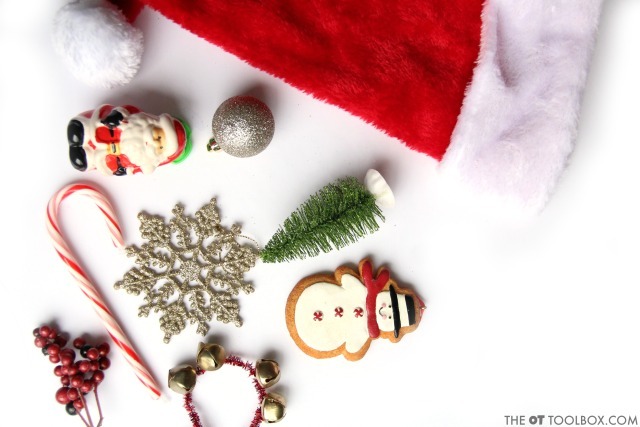 Items may include: candy canes, small stocking, bells, berries, pine twigs, figures, and ornaments of various colors. Spread all of the items on a table. Kids can play "I Spy" by visually scanning for a particular item described by its color or shape. What's Missing- Use those same Christmas themed items in a "what's missing" game that works on visual scanning, visual memory, figure ground, visual discrimination and other visual perceptual skill games. Show the student all of the items and then cover them with a stocking or Santa hat. Take away one of the items. Then reveal the items and see if the child can recall the "visual picture" they saw before to identify the missing item(s).